As creator/artists we’re walking museums of the imagination. Each of us a living memory-museum stocked with imaginary images painted and chiseled from past lives and years of earthly experience. Everyone existing as a museum without walls. Regarding how and what we wish to see hanging on our fluid walls depends on the things we have attached ourselves to. No two people see alike, which makes us unique from one another. Our capacity to surmise thousands of interpretations from the same symbol and/or image, creates an individual personality with their own point of view. Every experience is stylized within its frame, shaped into a form, developed into an image. Every facet of what has been perceived stored in the memory box we call the unconscious. What we choose to bury lays in the depths of our subconscious. Through selective perception we compartmentalize and assemble our world. We make of the world what we prefer. In other words we choose what we want to see and disregard the rest. When we draw or paint, the artwork and the sentiment is ours alone having risen from our own experience and what was assimilated from that experience. No one else can envision what we can clearly see in our mind’s eye—nor feel the colors or know the shape of the image better. At the same time we can exclude what not to see within that frame without anyone being the wiser. This can be a conscious decision, or from lack of awareness, an unconscious one. After all no one else is in our head seeing what we see or hearing what we’re thinking, or has to live with what we know. The choice is ours to make and ours alone. In contrast this is what makes a photograph a tangible, based-on-reality, therapeutic art. A picture whose objects and composition can’t be denied or overlooked (at least not for very long). A photograph is a statement, an impression along with its image that has been frozen in time. Though frozen in time its message and what it represents is very much alive. To the person whom this image resonates with, it’s a living document of a certain experience they wish either to forget or fondly recall. Yet it’s interesting to note how perception changes. How what was first perceived as true is suddenly seen as false. How the object we thought was there isn’t any longer, or what we missed to see the first time has made itself known and recognizable. Observing a photo more than once and returning to it, we understand how fickle perception is from moment to moment, hour to hour, day to day; according to circumstance, and like our temperamental weather, varying to a certain degree in meaning as feelings arise or not. Look at my photo montage below. What is it that calls our attention? What is that flash of perception: the thing that initially catches our eye to want to take another look? We give the photo a once over; another glance to get an idea of what attracts. 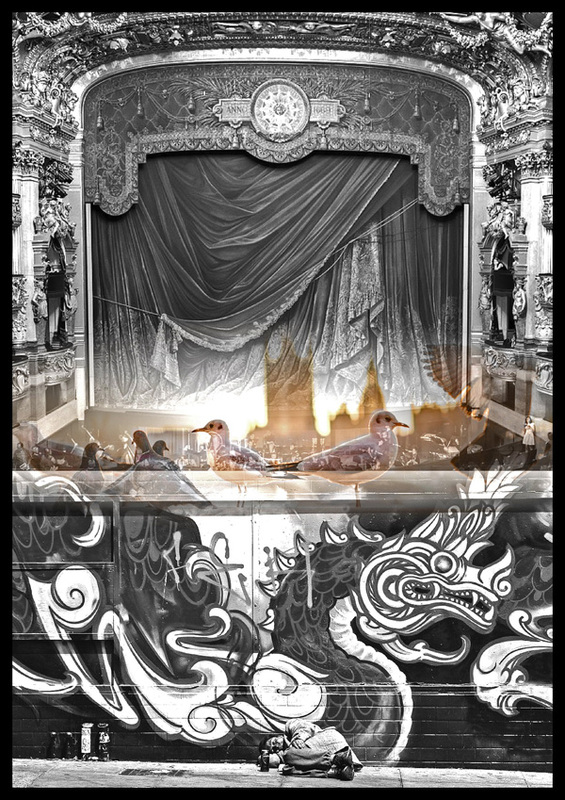 In general we assume the image an old theatre house: the velvet curtains draping the stage seen as a symbol and a dead giveaway. On further reflection something else intrigues. We zoom-in and refocus our attention. We notice the pigeons. A whole flock of birds parade a ledge. That triggers open a wealth of thoughts, followed by and woven through with memories, assumptions, beliefs and superstitions from what we’ve been taught and have learned. From here on end these shadows of remembrance cast a different light over the image and its story. This light tinged by what we know is an automatic determiner. It influences what we’re looking at and how it is to be interpreted. We gaze at an image through colored spectacles. We look though rarely see. We see only parts of a whole within the frame. Selective perception is not a fault. This is how we’re hardwired to perform. To select what we perceive buffers and protects us from a certain level of pain and traumatic events we’re not ready or feel prepared to face. In other words instead of looking at what’s there, we turn a blind eye. Turning a blind eye to what we fear and want to avoid doesn’t heal or lead to emotional wellbeing. It’s a temporary band-aide on a wound that won’t stop bleeding until it gets proper attention and care. Aware that this is what happens when we contemplate a photograph (or anything for that matter), the tendency to judge and relegate to preference subsides. Maintain awareness and we remain simple, present, observant, breathing in the image, receptive to its entirety. Seeing the whole picture, we notice the vagabond. We haven’t missed him curled-up on his side, fast asleep on the sidewalk. Photo Therapy. I. Ebaen, 2018.